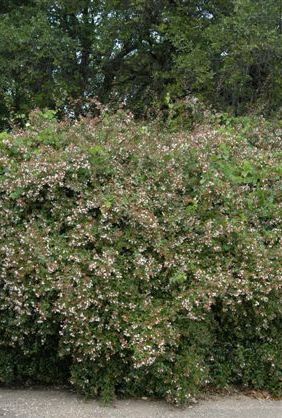 HABIT: Summer flowering shrub, tiny white or pink flowers. New growth in long shoots, bronze foliage color. Dwarf varieties (3’-5’ ht.) 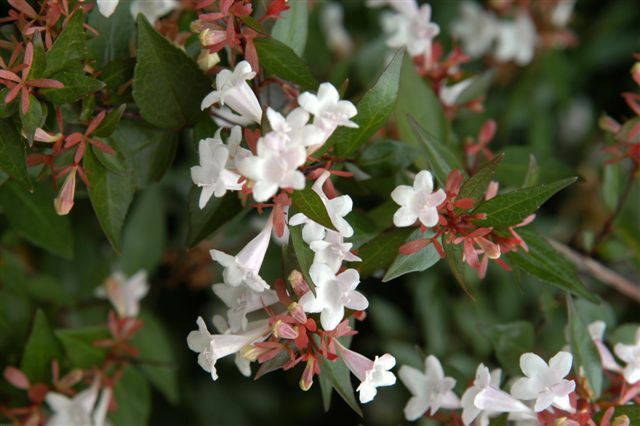 are available which are suited to smaller gardens: ‘Sherwood,’ ‘Prostrate,’ and ‘Edward Goucher.’ Abelia is native to Asia. CULTURE: Easy to grow in any soil, drought tolerant. USES: Boundary hedge, screen, barrier. Dwarf varieties are good for mass plantings. PROBLEMS: Few; plant looks bad when sheared into hedge.